(Click to Enlarge) Human Pulmonary Artery Smooth Muscle Cells: HPASMC. 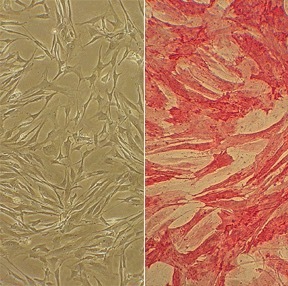 Cells isolated from the vessel that carries deoxygenated blood from the heart to the lungs. Sahoo, S., D. Meijles, I. Ghouleh, M. Tandon, E. Cifuentes-Pagano, J. Sembrat, M. Rojas, E. Goncharova and P. Pagano. 2016. MEF2C-MYOCD and Leiomodin1 Suppression by miRNA-214 Promotes Smooth Muscle Cell Phenotype Switching in Pulmonary Arterial Hypertension. PLoS ONE, 11(5):e013780. Zisman, L. 2015. Therapeutic Indications of Kinase Inhibitors. Patent Application 20150352111 A1. Ibrahim, Y., C. Wong, L. Pavlickova, L. Liu, L. Trasar, G. Bansal, and Y. Suzuki. 2014. Mechanism of the Susceptibility of Remodeled Pulmonary Vessels to Drug‐Induced Cell Killing. J Am Heart Assoc, 3: e000520. Feb 26. Zisman, L. 2014. Non-selective kinase inhibitors. Patent Application US 20150353527 A1. Bansal, G., D. Das, C.-Y. Hsieh, Y.-H. Wang, B.A. Gilmore, C.-M. Wong, and Y.J. Suzuki. 2013. IL-22 activates oxidant signaling in pulmonary vascular smooth muscle cells. Cellular signalling. 25:2727-2733. Bansal, G., C. Wong, L. Liu and Y. Suzuki. 2012. Oxidant signaling for interleukin-13 gene expression in lung smooth muscle cells. Free Rad Biol & Med, 52:1552-1559. Wong, C., I. Preston, N. Hill and Y. Suzuki. 2012. Iron chelation inhibits the development of pulmonary vascular remodeling. Free Rad Biol & Med, 53:1738-1747. Day, R.M., I.A. Matus, Y.J. Suzuki, K.J. YEUM, J. Qin, A.M. PARK, V. Jain, T. Kuru, and G. Tang. 2009. Plasma levels of retinoids, carotenoids and tocopherols in patients with mild obstructive sleep apnoea. Respirology. 14:1134-1142. Liu, Y., W. Ren, R. Warburton, D. Toksoz, and B.L. Fanburg. 2009. Serotonin induces Rho/ROCK-dependent activation of Smads 1/5/8 in pulmonary artery smooth muscle cells. The FASEB Journal. 23:2299-2306. Day, R.M., Y.H. Lee, A.M. Park, and Y.J. Suzuki. 2006. Retinoic acid inhibits airway smooth muscle cell migration. American journal of respiratory cell and molecular biology. 34:695-703. Preston, I.R., G. Tang, J.U. Tilan, N.S. Hill, and Y.J. Suzuki. 2005. Retinoids and pulmonary hypertension. Circulation. 111:782-790.